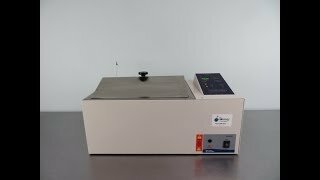 The Fisher Isotemp Shaking Water Bath provides consistent oscillation, and heating for life science and quality check applications. This 14.5 Liter bath has an adjustable shaking agitation rate of between 30-200 oscillations per minute. The Fisher Water Bath is microprocessor controlled, letting users choose their speed and set their temperature up to 99.9°C. The exterior is coated with a corrosion resistant epoxy powder finish, while the interior is an easy to clean stainless steel, with a stainless steel gabled lid that channels away condensation from dripping back down onto samples. This Fisher Scientific Shaking Water Bath Model #15474110 / 25/ 2884 has been fully inspected and is operating without issue. All of our lab equipment comes backed with our standard warranty. Should you have any questions, please don't hesitate to contact us.